KIRKMAN! 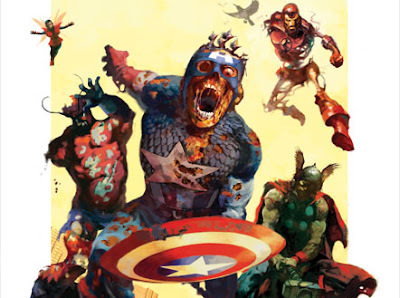 Marvel Zombies is the kind of thing I feel I should enjoy, but really don't. The basic concept, that silver-age superheroes are turned into flesh-eating monsters, is pretty solid, and I really enjoyed the crossover in Ultimate Fantastic Four, but I'm not sure that the zombies can carry the story by themselves. After catching and devouring Magneto (one of the last survivors on their world), the zombie Avengers set about figuring out how to continue existing now that all of their food is gone. When the Silver Surfer turns up (and is eaten), the heroes have to figure out how to defeat (then eat) Galactus. The story ends with an epilogue of the "Devourer of Worlds" arriving to consume an alien world, only for a team of zombie Avengers to leap out, clad in cosmic armour. It's an ok story all up, and I usually love Robert Kirkman's superhero stuff, but Marvel Zombies falls a little flat for me. I think part of the lack of appeal for me is that Marvel Zombies became an entire franchise of its own, the last one I saw was volume five, but I wouldn't be shocked to find more out there. For me, it's just a matter of the joke wearing thin, especially because I first came across the zombies in the pages of Ultimate Fantastic Four; flogging a dead superhero and all that. What makes me unwilling to completely dismiss the "Zombies" universe, though, is just how many good ideas come out of it. It's like the old What If? series (god, I miss those), it gives the writers to explore odd and interesting ideas that would never fly in the main comics. Howard the Duck leading an elite band of zombie hunters, the robotic heroes and villains of the world teaming up and the "Skrulltastic Four" are all great ideas that I'm glad to have, even if I'm not mad on the comics themselves.